This edited article about Ancient Egypt originally appeared in Look and Learn issue number 846 published on 1 April 1978. There are plenty of people who are prepared to argue that the Great Pyramid at Giza, in Egypt, was the work of space travellers from another planet. How else, they ask, could such an extraordinary building have been constructed almost five thousand years ago? They point out that the Pyramid was already two thousand years old when Rome was founded and Homer first recounted the adventures of Ulysees. Here is something, they argue, that is still considered as a marvel of engineering and so how can one possibly believe that the Ancient Egyptians commanded such skill at a time when the rest of the world was only just entering the Bronze Age? It may seem a sound argument. Certainly it is one that is hard to dismiss if you stand before the five-hectare site of the Pyramid and consider the fact that no corner of the six-million-tonne pile of limestone blocks is more than one centimetre out of true even today. But this engaging theory of interstellar building contractors is just not true. 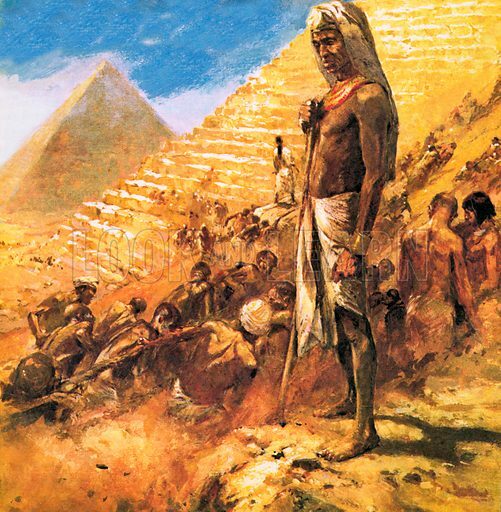 Modern research is so efficient that it tells us not only when and why it was built, but that the Great Pyramid was raised by the efforts of local farmers and peasants and not even by armies of slaves. An enormous task, but why was it undertaken in the first place? So far as the Ancient Egyptians were concerned, pyramids served not only a useful but an essential purpose, that of a safe resting place for their royal dead. The religion of the Nile people had grown up alongside their civilization, starting as a simple belief in the forces of nature and developing into a complex set of beliefs centred about the god Osiris. Osiris ruled an underworld where, providing that certain rituals were observed, the dead could continue a second life that was little different from their first. It was believed that their spirit would return and take up residence in its old, earthly body from time to time. It was this belief that made it so essential that a person’s body be preserved and safeguarded after death. Even a peasant could expect to be buried with care, accompanied by scraps of food and a few simple possessions to be used in his next life. An Egyptian pharaoh, no less than a god himself, naturally expected to be buried with all the trappings of royalty when his skilfully embalmed body was laid to rest in a massive tomb. These precious objects were a constant temptation for grave-robbers and made a secure burial place absolutely vital. It was during the 4th Dynasty (circa 2690 BC) that King Cheops planned the greatest of all the pyramids at Giza, close to what is now the city of Cairo. The colossal weight of the proposed building called for foundations of almost limitless strength, a problem the architects solved by choosing a table of natural rock as the site. This was levelled with infinite care and great ingenuity, for although the builders lacked surveying instruments they knew that water always found its own level. Accordingly, they built water channels round the site, and floated small boats at opposing points, their masts connected by cords. It was these cords that provided a constant level by which to work. Much of the Great Pyramid consists of blocks of local limestone, but the facing stone was to be granite that had to be transported down the Nile on barges from Aswan, 800 kilometres away. Granite is an exceptionally hard stone, and the workmen quarried it by chipping slots into the quarry walls and filling them with wooden wedges. The wedges were soaked with water until they expanded and split off chunks of rock which were then hammered into rough blocks. The more accurate cutting was done with the aid of bronze saws set with diamonds and other hard jewels. It must have been painfully slow work, and it took the workers 20 years to quarry what was needed. For all their ingenuity, the Egyptians never discovered the principle of the block and pulley. Instead they put the cut stones on rollers and hauled them up ramps that grew in size with the pyramid. Traditionally, the burial chamber was set low in a pyramid, and it had to be reached by a steep passage. In an attempt to make Cheops’ funeral furniture absolutely safe from grave-robbers, the architects of the Great Pyramid decided that once it had served its purpose they would fill up this passage with granite blocks. Grave-robbers would never be able to reach it because there would be no way in. There was, however, a way out, an apparently dead-ended well that was to be a subject for speculation down the years, and along which the workmen who sealed the tomb escaped once their task was completed. When, at long last, men succeeded in reaching the tomb it was only to find that grave-robbers had already stripped it of its treasures and that even the pharaoh’s mummy had disappeared. The fact that the robbery had been carried out so skilfully that no trace of a break-in had been left suggests that the thieves must have had special knowledge of the Pyramid’s design. Perhaps they were the descendants of the workmen who filled up the secret passage in the first place, and they made use of knowledge that had been passed down from father to son. Cheops’ funeral treasure has never come to light, and there seems a certain justice in the fact that the Great Pyramid continues to stand as a permanent memorial, not to the vanished power of a long dead pharaoh, but to the matchless skill of the men who built it with little more than their bare hands.